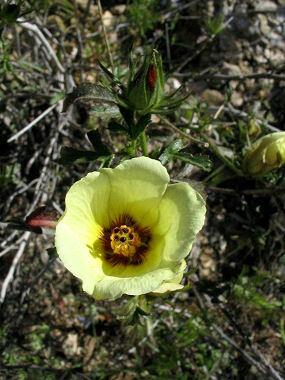 Desert Rose Mallow is a member of the Mallow Family. The plant appears as a straggling shrub with a woody stem and grows to 4 feet in height with dark green leaves that have red, toothed edges and are covered with short hairs. Leaves grow to 1 inch in length. The plant typically grows in canyons and on rocky slopes at elevations between 1500 - 4000 feet. Desert Rose Mallow is a favorite of bees. Desert Rose Mallow blooms periodically throughout the year and produces cream colored or yellow cup shaped flowers with 5 petals and a red center to 2 inches in width.